Cherry and Spoon: Broadway is Coming to Minnesota in the Form of Gavin Creel! Broadway is Coming to Minnesota in the Form of Gavin Creel! We're in luck, my fellow Minnesota theater lovers! One of today's hottest Broadway stars is coming to Minnesota for a concert next Friday, September 24. Gavin Creel most recently portrayed Claude in Hair on Broadway and London's West End. Hair is my most recent theater obsession, and I made a special trip to NYC in January of this year just to see this show with the original revival cast, especially Gavin, before the entire company moved the show to London in March. 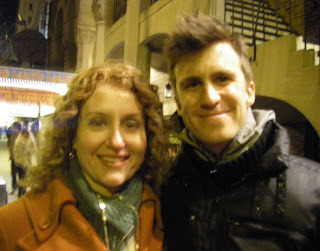 I was lucky enough to meet Gavin at the stage door, and he was every bit as sweet and kind as I expected him to be. In addition to being a talented actor and singer (check out his albums Goodtimenation and Quiet on itunes), Gavin is also very involved in social activism, particularly in the area of marriage equality. He founded an organization called Broadway Impact, and was also largely responsible for the entire cast of Hair taking the day off so that they could participate in the National Equality March in October 2009. 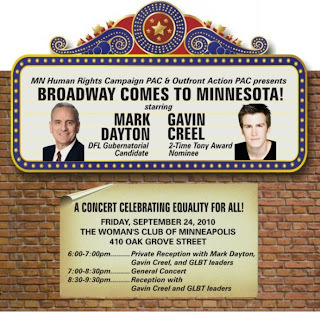 The concert next week is a fundraiser for Minnesota DFL gubernatorial candidate Mark Dayton, who is running on a platform that includes marriage equality. Great cause, great music, I'm there! For more information on the event or how you can donate, click here. Update: read my report of the event here.